Hi guys! Happy hump day! I've had a really busy week at work, so I'm a bit tired. 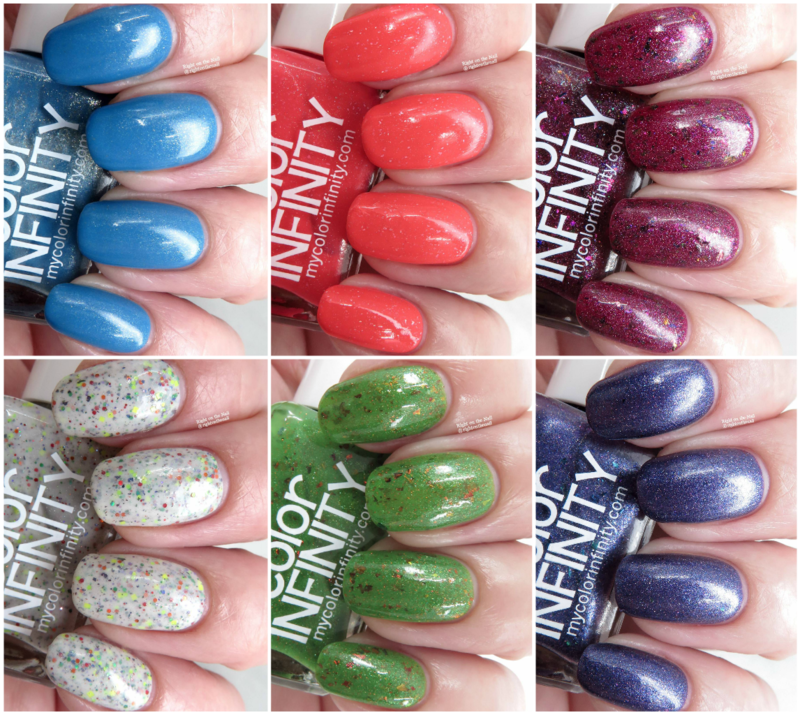 Tonight I have the rest of the Color Infinity Birds of Paradise collection to show you tonight. Don't forget, the overpours for the set will be released this Friday, May 25th. It just so happens to be the same day the Neon Crayons collection will be available so check out their website. Let's get a better look at these. Up first is Rainbow Lorikeet which is a white crelly base with neon yellow, blue, red, green, and orange hexagonal glitter, yellow square glitter, and chameleon flakes. This is one of my top picks from the collection and I was very impressed with the formula of this crelly polish. I used 3 coats for the photos above, and it applied easily. I love the neon glitters and flakes! Well, we're at my other top pick from the collection, Sun Conjure! It's a kelly green jelly base with chameleon flakes and holographic gold glitter. I found that the flake color was just perfect with the green base. I used 3 thin coats for full opacity, but you could get away with 2 if you use thicker coats. The formula and application was a breeze. The last color I have to show you is the special birthday polish for April. If you are the first 5 to order with the special code sent to you during your birthday month, you get the polish for free. If you happen to order after 5 codes have been used, you get 15% off coupon for the polish. I set my alarm and got my polish for free last month. Violet Backed Starling is a medium violet base with blue shimmer, chameleon flakes, and a scattered holo finish. I feel like I've said this a million times, but the formula was great, and I used 2 coats for the swatches. There you have it, what are your thoughts? I am very impressed with Color Infinity, and I will definitely be checking out their polishes this Friday. Their prices are competitively priced, especially if you buy the set with the discounted price. My top picks are Rainbow Lorikeet and Sun Conjure, but you won't be disappointed with any of them. The May Neon Crayon Collection is open for pre-order from May 25-June 4 with a discounted price of $30 ($1 off each color) if you buy the set. Make sure to check back on May 25th for the overpour from the Birds of Paradise Collection. You can find out more about Color Infinity on their website, Facebook page, Facebook Group, or Instagram pages.